Today, I’m introducing the next generation of our precision medicine mega trend. And I consider it to be one of the biggest innovations of the 21st century. It has attracted legendary tech investors like Bill Gates, Peter Thiel and Eric Schmidt. And this technology is expected to grow 4,300% by 2025, while saving countless lives. This marriage of tech and medicine stands to conquer leukemia, lung cancer, blindness, multiple sclerosis and more. We know our readers love these kinds of win-win opportunities. I was so surprised yesterday with a 188% gain on your recent recommendation. But you know what was even more rewarding? That they were successful with 100% of muscular dystrophy patients in clinical trial. It’s a 100% win for all. Thanks! I truly believe your recommendations touch on more than just making money. I’m up a whopping 175% on a company in the business of helping people stricken with illness. Thank you for picking stocks that make such a difference in people’s lives. 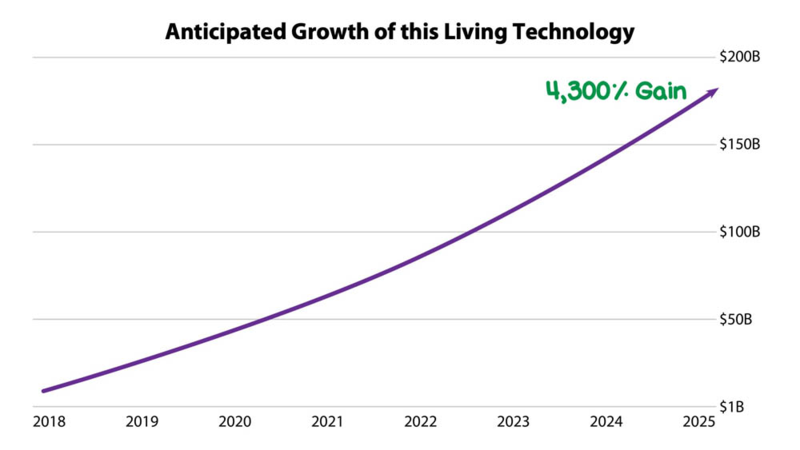 So, what is living technology? Living tech is already disrupting the stagnant pharma market. Recent developments in artificial intelligence (AI) by one company have finally given the pharmaceutical industry the tremendous AI computing power it needs. Without getting too technical, this allows drug manufacturing times to speed up from years to months. That means drugs get tested faster, get to market faster and save lives faster. This is truly a win for science, for medicine and for humanity. These kinds of feel-good investment opportunities are among my favorite to recommend. You can take advantage of biotech breakthroughs like living tech by investing in the Alps Medical Breakthroughs ETF (NYSE: SBIO).